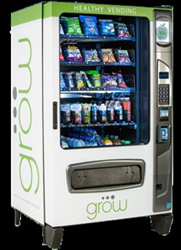 Grow Healthy Vending today announced a company record amount of locations secured for the month April, kicking off a strong beginning to the second quarter. Grow has concentrated heavily on the public and private school sector in response to the Smart Snacks in School program that was enacted by the USDA in July of 2015. The Smart Snacks in School program regulates specific nutritional standards on products sold to students through campus vending machines and as a leader in this movement, Grow Healthy Vending has secured vending contracts with multiple school districts throughout the United States. Grow Healthy Vending also recently entered into an agreement with the Army & Air Force Exchange Service to begin providing healthy vending services at select Army & Air Force bases and installations throughout the country, which included multiple machine placements at the Fort Benning United States Army Base. The company also announced an agreement to provide healthy vending services with Newport Beach, CA based Palace Entertainment. Palace Entertainment is a leading leisure park operator in the United States with water parks, theme parks and family entertainment centers in over 10 States. The Palace Entertainment portfolio of parks includes the Miami Seaquarium, Raging Waters of San Dimas, Raging Waters of San Jose, Sea Life Park of Oahu and several others. Other notable locations for the month included Strayer University which enrolls over 40,000 students at 76 Campuses and 16 U.S. States, the Oklahoma City Museum of Art and the Uhaul Corporate Headquarters located in Phoenix, AZ where 25 Machine combination, drink, snack and coffee machines placements were secured to serve the 6,000 plus on site employees.